Central Java Province is the home of tons of beautiful waterfalls. As for the reference, tourists should consider visiting Brebes Regency. It is because they can find a serene waterfall called Centel Batursari! The location is on the border of Tegal and Brebes City of Indonesia. To be exact, it resides in Bumijawa Sub-District. This one is known for its stunning scenery and refreshing nuance of the mountain. No wonder, visitors are able to enjoy relaxation and sightseeing there. The good thing is that tourists can come to the site regardless of the time, even at night! 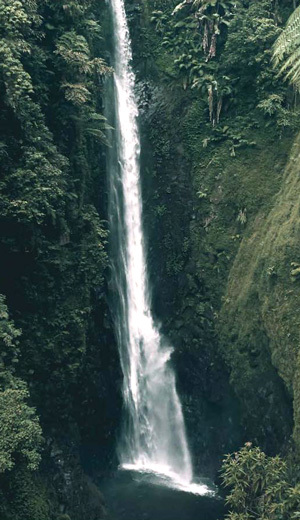 The good thing is that Cantel Batusari Waterfall is located on a mountain, so it offers refreshing and peaceful nuance. The splashing water feels so soothing and the scenery is amazing. This is why most of the visitors would like to enjoy relaxation there. The next recognizable feature of the site is the presence of a viewing post, which can be used for sightseeing in a more comfortable manner. Another impressive feature is the presence of colorful lights at night provided by the management. No wonder, some tourists often come to the site in the evening. The first thing to know regarding Cantel Batursari Waterfall is that it gets the water from Pedes River. What is next in Indonesia? It is important to know that the site features a lush forest with lots of tall trees. That means tourists should undergo a short trekking and exploration in order to get to the site. Instead of being a troublesome effort, this trekking gives an interesting experience to tourists especially those who love adventure. The only consideration is related to the route. It is better to hire a tour guide or porter who knows well about the route. Aside from trekking, others thing make a trip to Cantel Batursari Waterfall fun. For instance, it is related to the scenery. Visitors would find many types of trees growing abundantly there. The green color of the environment soothes everyone. With such pristine nuance, visitors can easily get rid of their stresses right away. Not to mention the air is quite refreshing, which helps them to relax during exploration. Once arriving at the site, tourists can use their camera and collect some beautiful pictures of nature there. These include the waterfall itself and surrounding trees. As for the consideration, everyone should avoid coming to the site during the rainy season. Not only the route becomes slippery, but it doesn’t give them the chance to take photos at all! Brebes Regency is located in Central Java Province. From the capital of the region, Semarang City, tourists need to head to Brebes first before heading to Cantel Batusari Waterfall located at Bumijawa Sub-District. The whole trip may take around 5 hours and 31 minutes, actually. It is because the distance is 208 km. As for the faster trip, tourists should take Pantura Street.